12 books in 12 months. 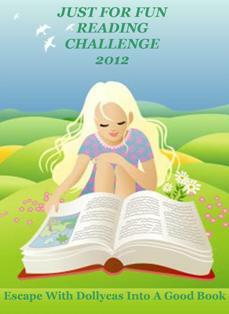 This year this challenge will be set up as a group on Good Reads. If you are not a member it is very easy to join. There are many benefits other than this challenge, you can keep track of the books you read and get great recommendations from other members too. Just go here http://www.goodreads.com/ to sign up. Just start a thread, WITH YOUR NAME AS THE TOPIC OF YOUR ORIGINAL POST. Select the proper folder using your first initial. There will be no forms to fill out each month. You just need to go back to your original post on GoodReads, and edit it each month to add the book you read plus the author next to each month. Please add a link to the book you read if you would like. This way you are in charge of your own recordkeeping and can check where you are in the challenge anytime you wish. Bloggers: Please grab the button and put it on your blog to show your participation and provide a link back so others can join. I hope you will write a post telling about your involvement in the challenge and invite you followers to join and participate! Bloggers if you feel compelled to review the book you can but it is not required. You may want to list what books you have read under the button on your blog. Read 1, yes, just 1 book for fun each month. Everyone that completes the Challenge, 12 books in 12 months will be entered in a drawing for a $25 dollar Amazon.com Gift Certificate or $25 at The Book Depository for International Participants. Last year I really hampered myself by using the books I read JUST FOR FUN as a prize. I found myself putting so much thought into my choices like: Is it the first in a series?, Will other people like this?, that I found I wasn’t reading the books I really wanted to read JUST FOR FUN, like some of my favorite series books that I didn’t want to part with. So my books will not be a prize in 2012. Instead I will add another $10 Gift Certificate from Amazon.com or The Book Depository as a 2nd prize. More prizes may be added depending on the number of participants. You can only add one book to your list per month. There will also be extra giveaways only for JUST FOR FUN CHALLENGE MEMBERS throughout the year! You can enter anytime between now and January 31, 2012. There will still be a JUST FOR FUN page here too for reminders and special announcements.